You’ve been looking forward to retirement for years, and you can’t wait for time to kick back and relax. After decades of toiling in the workforce, what could be better than a life of reading books, watching TV, and socializing with friends? Countless seniors head into retirement with this mindset, only to realize by the second month that they’re bored out of their minds. Rather than relaxation, endless free time has left them feeling unsatisfied, restless, and without purpose. But where did they go wrong? ● Provide a social outlet. Seniors engaged in a hobby have opportunities to connect with new friends who share their interests. This social support can be invaluable in old age, facilitating everything from early detection of illness to prolonged independence. ● Promote brain health. Learning a new hobby challenges your mental abilities. It engages your memory, problem solving skills, and other cognitive faculties. This keeps you sharp as you age and helps prevent cognitive disorders that affect the elderly, like dementia and Alzheimer’s disease. ● Keep you active. Whether a hobby is active in nature or not, simply having a hobby can help seniors stay active as they age by getting them out of the house and using skills that might otherwise wane. ● Bring in money. While it’s perfectly fine to pursue a hobby for nothing but the enjoyment of it, seniors who could use some extra cash can turn a hobby like woodworking, embroidery, or collecting into an income stream. ● Improve self esteem. When a senior leaves the workforce or moves on from raising a family, they can be struck by a lost sense of purpose that devastates their self esteem. A rewarding hobby can fill that hole and build seniors’ confidence. If you don’t already have a hobby or two you enjoy, spend time trying out new activities until you find one that clicks. There are plenty of hobbies that seniors can get involved in, and they range from activities dominated by older adults to ones that attract a multi-generational group. ● Woodworking. Creating wood crafts is a popular hobby among retired men — so much, in fact, that some retirement homes are including wood shops in their community’s design. 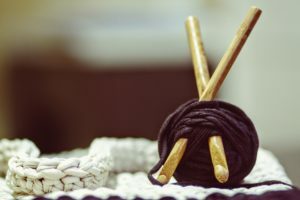 As long as a senior can safely use tools, they can enjoy a hobby that lets them create practical and fun projects for personal enjoyment, gifts, or sale. ● Sewing, knitting, or crocheting. While these are somewhat cliche hobbies for seniors, there’s a reason they’re so popular. Crafting is not only emotionally soothing and mentally stimulating, it’s also personally rewarding as it lets seniors create something tangible that they can share with loved ones. ● Walking, swimming, dancing, or golfing. Active hobbies are a great choice for seniors due to the importance of healthy habits in later life. Walking is the ideal free hobby, swimming offers arthritis-friendly exercise, and dancing and golfing let older adults get social while getting active. ● Volunteering. If giving back to the community is a priority for your senior years, get involved in volunteering. No matter the cause you choose, you’ll meet people, discover new skills, and enrich your life. ● Gardening. While gardening for seniors is hardly a new idea, there’s a reason this retirement hobby is so popular. Gardening increases physical activity, maintains coordination and motor skills, and reduces stress and anxiety in senior citizens. If you haven’t already thought about how you’ll stay happy, busy, and productive in retirement, now is the time to start. Find an activity you enjoy, cultivate your skills, and discover how much of a difference a hobby can make to your post-retirement satisfaction.